So I have the Spekkio code figured out, now its just a matter of getting the bytes right, making magic learning optional and making Crono optional are just a little harder to work together but the Spekkio intro wont be gone in the final. Sadly Ayla isnt available for anymore of the game then she used to be for the moment, the pictures I posted a while back of Magus's castle were just test pictures, though the option of being able to recruit her and Frog earlier has crossed my mind. Oh good. I'll test that this weekend. Then I should be able to go through to Zeal (assuming no new game breakers are found). Ok so I got ambitious and fully solved the Spekkio problem, he now functions completely independent of the main story with or without Crono. There are currently no known bugs. Here is a pic of the remodeled Zeal Palace library I did while waiting for Andrew to finish playtesting. Did you mean for the shop item limit to be set to 11 instead of 10? Because that's what it's set at. 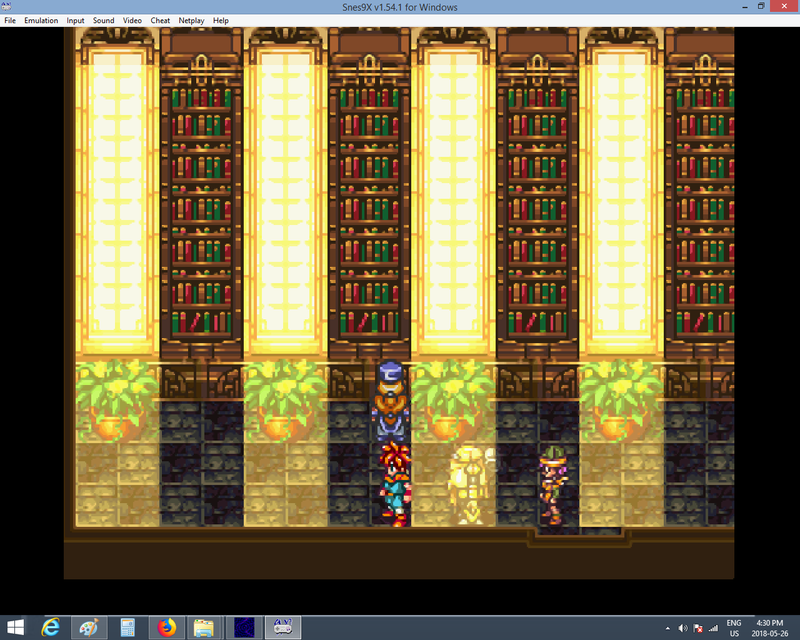 Crono's mom is still in Magus' castle (Flea's path to the right) when he's not in the party, and there's a bugged out version of the missing loved one stuck in a pillar. That wasn’t intentional but not really a big deal, fyi there was some sprite clipping in Magus’ castle, at least on game breaking, theyre all fixed now but I’ll have to send you a new patch tomorrow morning. Just hit a soft lock when the first battle down the central path in Magus' castle was supposed to start. This is really coming along. Looks like you're having fun! 1) Hey trading hut hard lock. You have returned. 2) The red rock quest (first Ayla quest) stays completed if you new game plus. The trading hut problem must be from using an older version of the Nes Difficulty patch because I have no problems with it, the second problem actually answers a few questions, Mauron told me where to find some free bytes to create events with and it seems they don’t reset on ng+. Also Magus’ castle will still lock up on your game, I removed the offending scenery but forgot to change the tile properties, I’ll try to get you another patch today though. Can you send the full list of most recent ones? - Fastest race times with the jet bike. - Money (this one is likely impossible to do safely though). - Character names (so they default to what they were named as last play through). I don't know how much of that stuff can be saved in the 7E2881-7E2f7f range but offhand I'd say silver points and cat food easily, jetbike and money probably easy as well though I think they're 3 bytes, I sent you a patch that resets all those bytes currently used but they only reset on a new game or new game plus not on a current save sorry. Edit: should mention that the patch I sent you also fixes the soft lock in Magus' castle, necessary to continue. Glowing Magus statue in the ozzie trap door room. Only happens after warping back up. Marle turned into Crono (who wasn't in my party) when I beat Magus, but in a messed up pallet swap sort of way, Then the game text for the cutscene afterwards was complete gibberish. Ayla tac-off scene with dactles. I switched out Crono for Frog, and poor Frog got left behind! Went into Zeal's palace and music didn't switch (using MSU), then it did after I scratched the Nu. The glowing statue I’m not sure, but it’s not game breaking. Magus’ room is fixed and the text after is no longer gibberish, the script for Crono’s room didn’t like all the lines I added to refresh the bytes that were carrying over, I moved about half of them to the Yakra room as thats an early storyline point that doesn’t have a very full script. I wanted the music to be corridors of time on the first visit and the more ominous Zeal palce on the second so I forgot to adjust the Nu for this. Frog, Robo, Marle, and Lucca all share the same dactyl spot, the only way to make this work is to force Crono into the party. It took me three weeks to get that part to work and thats the only way it will sadly. Don’t forget you can challenge the Frog King in Frog’s burrow now, this part has been improved greatly. Without Chrono's head shaking that scene felt way less powerful. Oh well, give me that red knife! These two are easy enough to do. They're already loaded at the start of New Game+, then reset shortly after. You'll need to edit Location 00's events. Before the MemCopy to Mem.PCNames, add the following. I haven't tested this, but it should work. First cutscene in Undersea Palace softlocks. oh crap, its very possible another one of my carryover bytes is the culprit as I had to add one in order to make recruiting Magus optional anytime. It’ll take me a little while to get a fix for that. You could probably do a MemCopy with a bunch of zeroes in the same part of Location 00's events. Yes thats far more efficient that what I did. The good news is that I have money and character names carrying over, the bad news is that I have no clue why the first Ocean Palace cut scene freezes,. renkoha has given me a small bug report, most of that is corrected including the early Magus bug. @Mauron would you happen to know the values of the above mentioned range on a fresh new game? Also 7F0210 is a temporary location reset on a screen change isnt it? I ask because the Ocean Palace throne room has a lot of events dependant on it and I want to make sure I didn’t corrupt it somewhere.